I currently teach at Xiamen University (shown below), and I also studied Mandarin here back in the 1980s, so as both teacher and student I can recommend this institution. If you are looking for a college in China, this one deserves serious consideration! 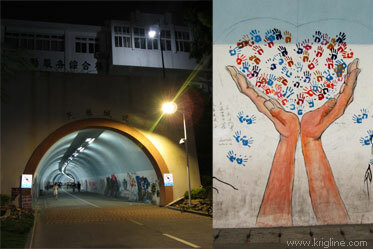 This is the "old campus" of Xiamen University, one of China’s leading education institutions. The tall, central building was added in 2001, but the campus is almost 100 years old. A 1000-year-old temple is just out the university gate (you can see smoke rising from it). This photo was taken from Caiqingjie Lou, which also houses one of our favorite restaurants. 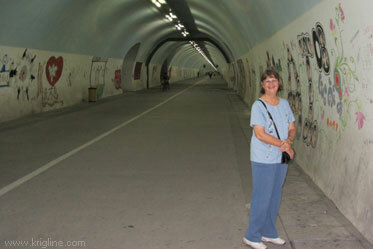 Behind us, it is a short, steep walk to the beach gate, beyond which you'll find a nice bike lane that goes around Xiamen island. Students also enjoy climbing the nearby hills; our son Andrew loved climbing up the mountain with Michael in both 2002 and 2005 (just as I did when I studied here)! Xiamen University (XMU) was founded in 1921, and consistently ranks in China's "top ten" universities.  It is the only major university in one of China's Special Economic Zones, and (perhaps more importantly) in a coastal, temperate climate with a reasonably-low level of pollution. The main campus is nestled between mountains and the ocean, and is recognized as one of the most beautiful universities in China. Not only can you learn to speak the world's most-spoken language, but there are also many graduate & post-graduate programs conducted completely in English, including economics, management, international law, medicine, oceanography, and international relations. By following the school motto--Pursue Excellence, Strive for Perfection--Xiamen University has become a first-class comprehensive university in China with extensive international influence. It has over 1500 professors and associate professors, and a total enrolment of over 38,000 full-time students (including over 20,500 undergraduates, 15,550 master students, 2,550 doctoral students, and 2500 international students). 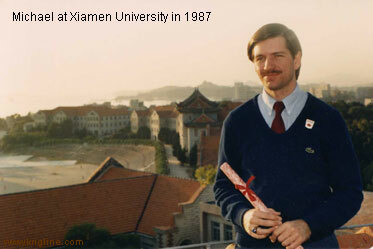 From 1985 to 1987, Michael studied Mandarin at Xiamen University (see above). In 2011, he joined the faculty, teaching in English to International Economics and Trade students. The university has several campuses, including the small Haiyun campus (shown below) where Michael's classes were held in spring 2013 (in the classroom building, below right). 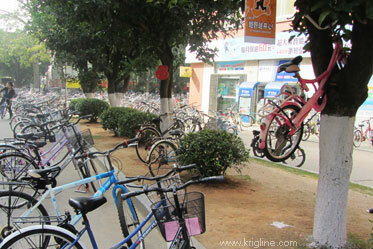 Notice the host of bikes, as students leave between classes for another campus or for the dorms. Also notice the ships in the channel in the distance. The building across the street says "Xiamen Software Park", but it shares a cafeteria with XMU students. In the fall of 2013, he taught American Culture on the main campus. Do you ever forget where you parked? And do you ever have trouble finding a place to park? Here's a creative solution! I snapped this outside one of the university's busy student cafeterias, fall 2013. This is the university beach at low tide on a summer day. 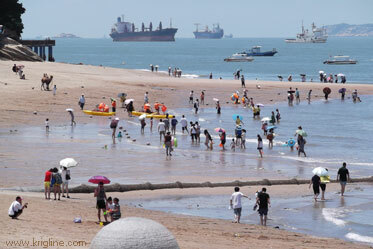 Notice the big ships that constantly come and go into the harbor. 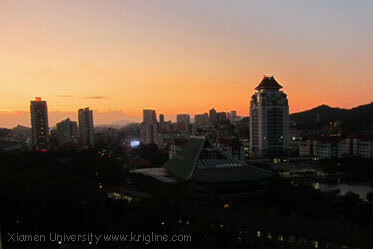 The photo above (Xiamen University at dusk) is also available on our free wallpaper page. 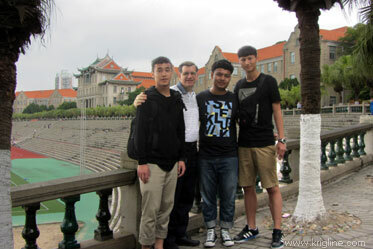 Friends from Fuzhou University visited Xiamen during the May-Day holiday, and I enjoyed showing them around campus. If you are one of our former students, or friends from other parts of China, we would love to show you around beautiful Xiamen! Click here to see my February 2005 XMU Reunion, or click here to see the Zhangzhou campus and other nearby places.